Block Treasure is one of four randomly selected bonus stages after completing a World in Dance Dance Revolution: Mario Mix. 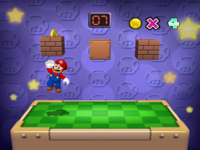 In this minigame, the player has to step left and right on the Dance Pad to have Mario or Luigi move to choose a block then step up repeatedly to jump and hit the blocks for items. The blocks may either be empty, have one coin, have ten coins, have a 1-Up Mushroom, or have a Spiny which will shrink Mario or Luigi. When life gets hard, blow off some stream by punching bricks, Anything could shake loose! This page was last edited on May 25, 2018, at 18:56.